It’s all about the list. Some experts say that the list is responsible for up to 70% of campaign results. If your list is good, your campaign may deliver solid results. If your list is bad…it’s over. Your campaign will fail. So, where can you get good lists? If you can afford $3k per month you’re going to want to look at a DiscoverOrg or a Rainking. If you don’t have that much budget, you’re going to want to take a look at a Data.com or Zoominfo. If your budget is really tight and or the providers mentioned don’t offer lists in your target market, then you are going to have to look at making your lists. Within the realm of making your own lists, you have basically two options. The first is to outsource it via a service like Odesk. I’ve had great success going this route in the past. The other option is to make the list yourself. However, this can be incredibly time consuming and difficult. Fortunately there’s a tool on the market that may make it easier for you to do your own list creation. It’s called SalesLoft Prospector and it deserves a closer look. It has the ability to mine Linkedin and retrieve contact details quickly. This can be a huge help. As always with lists, the devil is in the details. In order to run a high volume outbound lead generation campaign you are going to need thousands of targeted names, including direct dial telephone numbers and work email addresses. SalesLoft Prospector appears to be able to get some email addresses, but it’s not clear if they are business or personal. My guess is that it will be a mix because that’s what people list in their LinkedIn profiles. As for direct dial telephone numbers, I’d be shocked if Prospector would allow me to get these. I don’t think many people include their corporate direct dial telephone numbers in their profiles, but I could be wrong. If so, the product is a total home run. If not, it still has value. I have not yet tested SalesLoft Prospector but have studied their video and website carefully. Overall, I’m excited about the tool because it seems to bring the possibility of creating your own lists a lot closer to reality. You should definitely check it out. It’s all corporate emails and they are not pulled from LinkedIn. They are pulled by testing the prospects web domain. 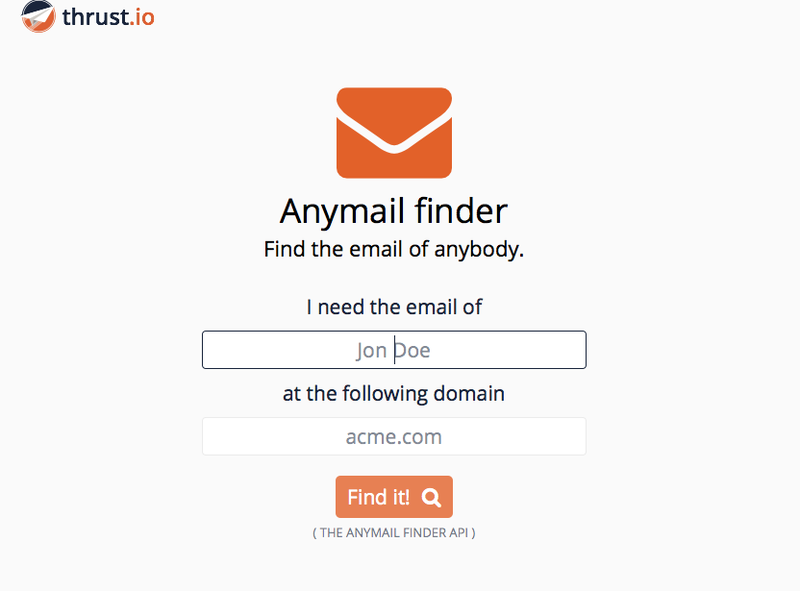 How to Find Anyone’s Email Address…Quickly! How would you like to be able to quickly and easily grab any prospect’s email address? If so, then I’ve got good news for you. There’s an online software product that lets you find any email address in a matter of seconds. In this article I’ll walk you through it and discuss some of the pros and cons. The software is called thrust.io. It’s really easy to use. You just enter the person’s name and their company domain and then hit the “find it” button. A few seconds later it will return the person’s email address to you. Simple, no? Okay, so lets consider some pros and cons. On the pro side of the equation we have the fact that this software works as advertised. I did several tests and each one worked. I was able to get the person’s email address. I then sent each of them an email and none bounced. In addition to the fact that the software works, it’s free. This is a great solution for salespeople engaging in what I term “manual prospecting.” Manual prospecting refers to prospecting without enough leverage to produce big results quickly. No doubt about it, with diligence and time a sales person could use this tool to create a list of target prospect email addresses. Now let’s look at some of the cons. In point of fact, I see only one con associated with thrust.io and that’s a lack of leverage. If thrust.io would let me find ten, twenty or perhaps 100 email addresses at a time, then we’d be talking my language. So, for anyone who does high leverage high volume outbound lead generation, this tool is not ideal. It can be helpful but it’s not a complete solution in the way a DiscoverOrg, RainKing and or Data.com are. It should be noted that thrust.io is free and the others are not. The good new here is that there may be an middle ground solution that would let individual sales people get more benefit from thrust.io. Here’s how that might work. You could hire someone on Odesk to create a list for you. All you would have to do would be to create a spreadsheet with a list of target companies and names. You could get these names at Linkedin. You send the list and a link to thrust.io, to the Odesk person. You ask them to then use thrust.io to find the email address for everyone on the list you sent them. This process would allow you to get a list of several hundred emails for cheap. You’d have to spend a few hours on Linkedin to generate your target list, but as a salesperson, you have to do that anyway. In summary, this is a great free tool that any salesperson should be able to put to good use. It’s not as useful if you’re doing industrial strength list building but the Odesk option might be able to help. The bottom line is that if you are in any kind of technology sales and or lead generation, you can’t go wrong giving thrust.io a closer look. Check it out.